Load moving skates are mechanical handling equipment used to transport heavy machinery and other items in the work area. Machinery skates sometime use nylon, polyurethane or steel wheels/castors and work though are also less often fitted with roller tracks, like tank tracks (Economical and ideal for general workshop moving jobs, all types of machine tools, fabrication etc). Dependant on customer requirements we offer load moving systems with fixed and swivel castors or indeed a combination of both. Most of our materials skates are designed to be manually manoeuvred (push/pull) though most can be assisted by a tug or fork truck. 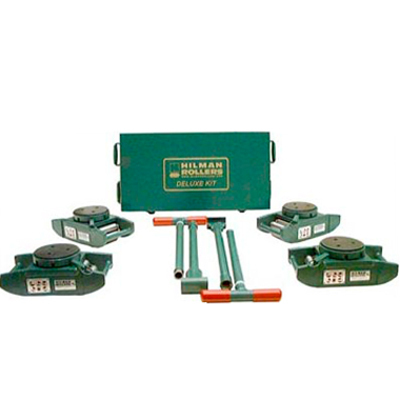 Materials load moving skates work best on a flat smooth surface free from dirt or other obstructions. All our load movers are individually load rated and/or rated as a set. Sets of machinery skates usually include one front steerable skate and a pair of fixed wheel rear trailing skates with a tie bar. We also sell many individual skates, roller pinch bars to manually raise a load and materials movers otherwise sometimes referred to as materials scoots (or scoots).